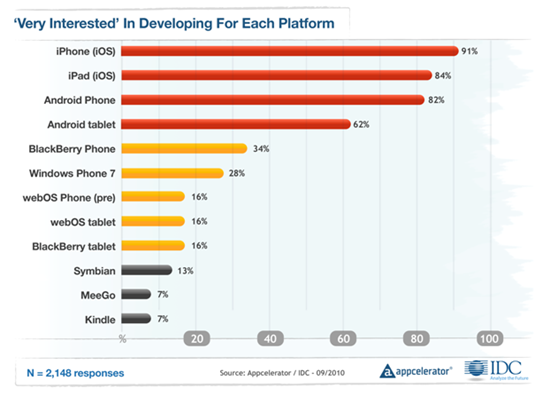 After running June's report, Appcelerator wanted to get a better look at the "why" behind the results as well as a more in-depth look at how developers view a wider range of devices. Enter the Q4 report: among the more general findings, Android's long-term outlook has risen, while iOS's has dropped - from 54% to 58.6% for Android, and 40.4% to 34.9% for iOS. Looking at the "why," developers believe Android is better positioned to expand to more devices. Let's take a quick look at how developers view the market for particular devices. Given that the gap in long-term outlook has grown to 23.7%, it's surprising to see that developer interest in each platform today has barely changed. June showed 90% of developers interested in iOS and 81% interested in Android, and for the Q4 report, both edged up 1% (to 91% and 82%, respectively). Blackberry held steady at 34%, while WinMo 7 gained 1%, webOS (surprisingly) gained 3%, Symbian dropped 2%, and Meego dropped 4%. Amazingly, tablet interest for the iPad and Android remained unchanged since June. Then again, we have yet to see any major changes in the market thus far - the iPad is still king, and there are no real Android contenders on the market yet. That said, despite Android tablets being a few months off, interest is higher (at 62%) than iPad interest was before its launch (58%). webOS and BlackBerry tablet interest is a meager 16% for Q4. Appcelerator and IDC (International Data Corporation) suggest that high phone interest translates to high tablet interest, which makes sense and looks to be supported by the numbers. Here's our true Android victory: more developers show interest in Google TV than Apple TV. Surprising? Certainly, especially considering the hypothesis mentioned above (that interest in one Android device translate to interest in another). Still, we'll take it. To quote Scott Ellison, VP of Mobile & Wireless for IDC: "Television needs new and more effective ways to create immersive experiences, engage audiences with advertisers, integrate social networks, and drive viewership of original broadcasts." The findings suggest that developers believe Google TV is well poised to accomplish those goals. The end result: the majority (72%) of developers believe Android is better positioned "to power a large number and variety of connected devices in the future," versus 25% for iOS. We've actually discussed fragmentation in Android and iOS twice before, and pointed out that in terms of raw numbers, iOS is technically more fragmented (I say technically because our fragmentation numbers include minor iOS updates). Then again, an iOS app will run on any version of the OS, but most Android apps won't run on 1.5/1.6. It seems developers are well aware of this, as only 11% of developers view Android as the least fragmented (ouch), while iOS checks in at 74%. Wow: we really get our asses handed to us on Market and Hardware, don't we? iOS is overwhelmingly rated as having a bigger, better market in every way, and is better rated in terms of Hardware too. However, developers rate Android as a more capable, open platform, albeit nearly 1/3 as secure as iOS. And specific aspects of long-term outlook? Split - Apple manages a win in hardware distribution and near-term, but Android is seen as a better fit for more devices and thus has a better long-term outlook. Also interesting: Facebook and Twitter integration ranked at 6 and 8 at 65% and 60% - meaning the majority of developers see social integration as being seriously important. 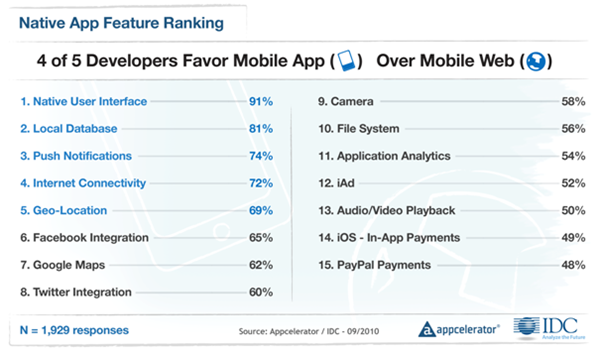 For iOS, in-app payment ranked at 49% - a substantial selling point for developers, apparently. It seems it would be a good idea for Google to implement something similar in Android. The report suggests to me that the tides are really starting to turn in favor of Android (then again, as I've said before, even if Apple doesn't top some charts they're still not going to be hurting). However, it seems like Google needs to make some serious refinements to Android before it can really shine. In particular, the issues of fragmentation and the market both need to be addressed. Having roughly one in four users on Android 1.5 and 1.6 is unacceptable, especially given how long 2.1 (and now, 2.2) have been available. Similarly, the nearly uncontrolled, poorly organized market seems to be a major turn-off for developers. Then again, both issues stem from the openness of the system and Google's hands-off approach - both traits which developers believe give Android the long-term edge. The Q4 report was based on a survey of 2,363 developers, and was conducted by Appcelerator and IDC on September 14-16. 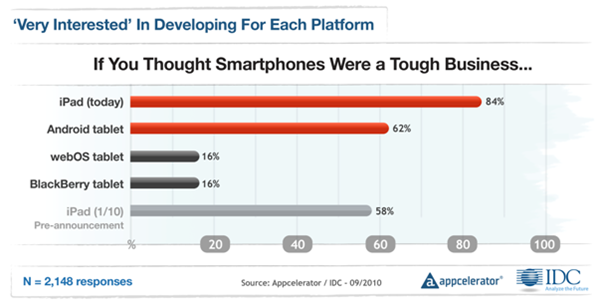 Note: the developers surveyed were users of Appcelerator's proprietary Titanium app-development software. MOUNTAIN VIEW, CALIF. and FRAMINGHAM, MASS. – September 27, 2010 – Appcelerator®, the leading platform for rapidly developing native mobile, desktop, and iPad applications using web technologies, and International Data Corporation (IDC), today announced results from a joint Appcelerator-IDC survey of nearly 2,400 app developers around the world. The survey reveals developer plans to build applications for various mobile and tablet platforms, as well as their preferences for popular mobile APIs. Appcelerator also announced that it has entered into a partnership with industry-leading analyst firm IDC to deepen the level and quality of research conducted in Appcelerator’s quarterly reports. Taken September 14-16, the Appcelerator-IDC Q4 Mobile Developer Report shows that Appcelerator Titanium developers favor Android over iOS in TVs and other embedded devices. The survey also provides fresh insight into the emerging “war of the Mobile Web 2.0 SDKs” between popular social, advertising, commerce, media, and other web-based APIs that are now shaping the mobile application landscape. This report is posted on: http://bit.ly/appcelerator_idc_q4_mobile_developer_report. - 72% of developers say Android “is best positioned to power a large number and variety of connected devices in the future”, compared to 25% for iOS. 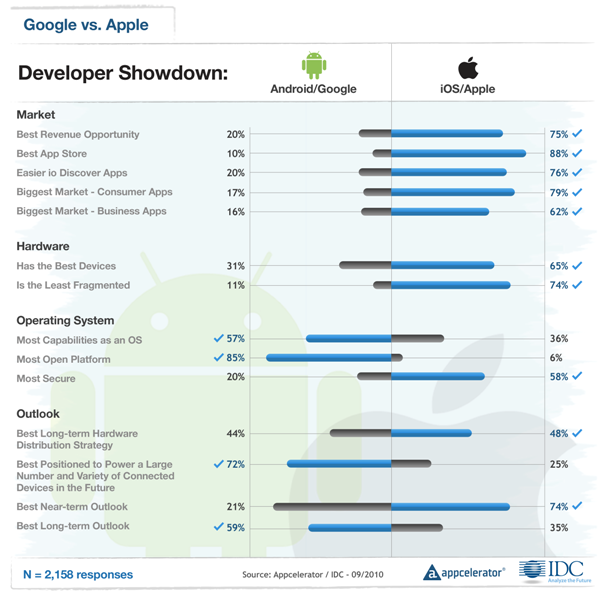 As a result, 59% of developers now favor Android’s long-term outlook, vs. 35% for iOS. This gap has widened 10 points since the June survey. - However, Apple iOS continues to dominate in all categories relating to market/revenue opportunity and current devices. 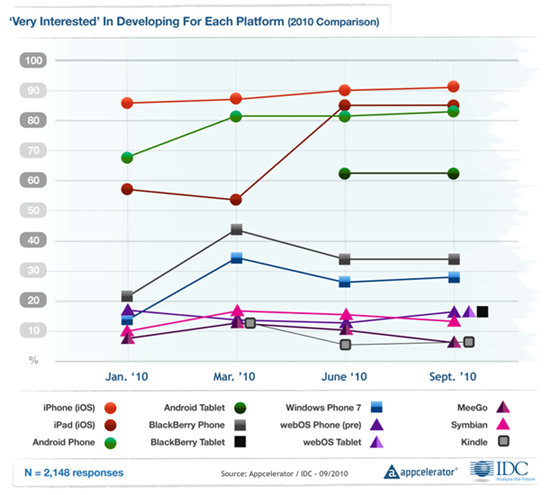 iPhone continues to lead overall developer sentiment with 91% saying they are “very interested” in developing for the device compared to 82% for Android phones. - Developers show enthusiasm for connected TVs, with 44% saying they are ‘very interested’ in developing for Google TV vs. 40% for Apple iTV. Explained Scott Ellison, VP Mobile & Wireless, IDC, "Apps are poised to help remake the television viewing experience just as they have remade the mobile experience. Television needs new and more effective ways to create immersive experiences, engage audiences with advertisers, integrate social networks, and drive viewership of original broadcasts" he added. "The television players who most effectively integrate app developers into their connected TV strategies are poised to potentially remake the television experience as we know it". - Android tablets are poised for developer lift-off: At 62% expressing strong interest, Android has similar enthusiasm to the iPad at an analogous point in time (last January pegged iPad at 58%). This is great news for Android tablet device OEMs. On the other end, new research shows webOS and Blackberry tablets currently have little interest from developers (16% for both), indicating HP, RIM, and other tablet platform challengers need to generate significant developer enthusiasm well in advance of upcoming launches. - Fragmentation remains a key concern for Google, with 74% of developer respondents describing iOS as "least fragmented" but only 11% describing Android as such. - Social: Facebook slightly leading Twitter 65% to 60%, with Foursquare trailing at 22%. Appcelerator’s direct experience shows Facebook having a key strategic advantage in its popularity as a primary identity system for mobile applications. - Commerce: iOS in-app purchasing and PayPal payments are also locked 49% to 48% in a head-to-head battle for mobile commerce leadership. Of note, PayPal is nearly as popular as Google Checkout (33%) and Amazon (18%) combined. PayPal also leads iOS in developer popularity in Europe and Asia. - Media: Use of the camera (58%) far exceeds use of popular photo sharing services flickr (21%) and Twitpic (19%). Stronger interest in using the camera for barcode scanning (31%) and augmented reality (41%) shows developers have bigger plans for mobile phones than simple photo sharing. - Advertising: iAd (52%) leads Admob (36%) with developers noting a preference for iAd’s richer ad units and higher click-through rates, even as fill rate remains an issue. - Analytics: Application analytics (54%) is currently the most popular form of analytics, however there is strong interest in transaction (42%) and geo-analytics (35%) as location and commerce take center stage in mobile. Top consumer app categories include: social networking, entertainment, utility, games, and lifestyle applications. Top business applications include: productivity, document management, sales force automation, messaging/communications, and a 3-way tie between finance, retail, and healthcare vertical applications. Note that most of these scenarios rely on Internet connectivity and the native device capabilities listed above. Appcelerator is the leading platform for rapidly developing native mobile, desktop, tablet, and other multi-screen applications using web technologies. The company’s flagship offering, Appcelerator Titanium, is the only open source platform to enable native cross-platform development, from a single codebase, at web development speed. Appcelerator’s customers can leverage their existing skills and open, industry standard technologies to create and commercialize mobile, desktop, and Web apps from a single platform, decreasing time-to-market and development costs, increasing customer adoption and revenues, and enjoying greater flexibility and control. For more information, please visit www.appcelerator.com. International Data Corporation (IDC) is the premier global provider of market intelligence, advisory services, and events for the information technology, telecommunications, and consumer technology markets. IDC helps IT professionals, business executives, and the investment community to make fact-based decisions on technology purchases and business strategy. More than 1,000 IDC analysts provide global, regional, and local expertise on technology and industry opportunities and trends in over 110 countries. For more than 46 years, IDC has provided strategic insights to help our clients achieve their key business objectives. IDC is a subsidiary of IDG, the world's leading technology media, research, and events company. You can learn more about IDC by visiting www.idc.com http://www.idc.com. International Data Corporation and IDC are registered trademarks of International Data Group, Inc.